for Gmail administrators to support their users with better troubleshooting tools. 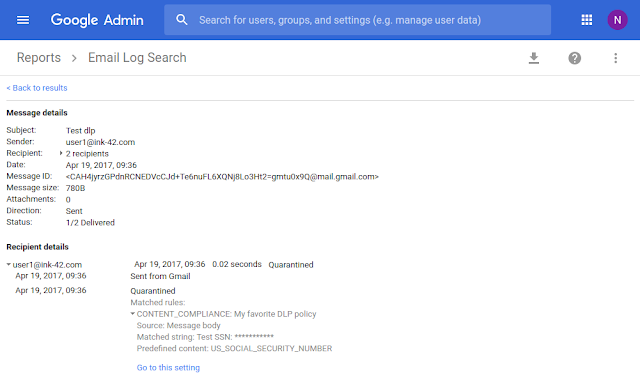 As a follow-up, we’re launching several improvements to the Email Log Search tool. While the message ID is a great way to find the exact message for troubleshooting, it’s not always convenient for users to provide this information. Now, email administrators can search by email subject and save time troubleshooting with their users. Now, you will be able to know which of your email policies triggered which action and make modifications to your policies by clicking on a link to the relevant policy. The email log shows delivery status for emails in your domain. For emails that didn't reach their destination or triggered an email routing rule, the status will explain why. For example, emails may have been quarantined as spam, or bounced because they couldn't be delivered. Thanks to all of the email administrators who provided feedback about Email Log Search. Last December, we made it easier for Gmail administrators to support their users with better troubleshooting tools. As a follow-up, we’re launching several improvements to the Email Log Search tool.